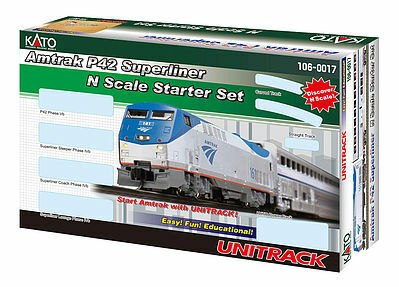 This Amtrak Starter set includes a GE P42 locomotive and three passenger cars, along with a complete 3'x4' Oval of Kato UNITRACK with re-railing track, a Kato Power pack, and a starter guide. Everything you need to begin building an N gauge train layout at home! Retail $300.00 SAVE 24% ! Easy to set up. Has all the necessary parts to run a basic train set - controller, track, engine and passenger cars.